Chettinad Cuisine is so spicy and delicious. These days I have tried out several new dishes with this masala. Methi Palak is one of them. The taste is really awesome. It can go well with rice, rotis, dosas and appams too. 1. Wash the greens.Drain and set aside. 2. In a pan heat the oil. Add the tempering ingredients. When they crackle, add the crushed garlic and green chillies. 3. Saute and add the greens, tomato puree and salt. Simmer to cook. 4. When half done add the Chettinad masala, grated coconut and the turmeric powder. 5. Sprinkle little water if needed and cover to cook until done. nice twist to greenies.. rocking dear.. I just love the way you cook. very nice recipe. 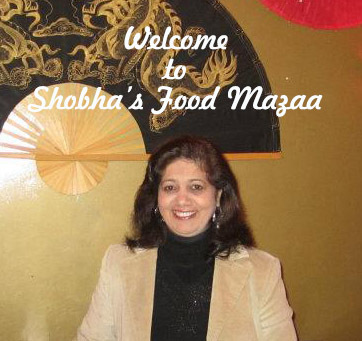 Thanks for linking to the event Shobhaji. 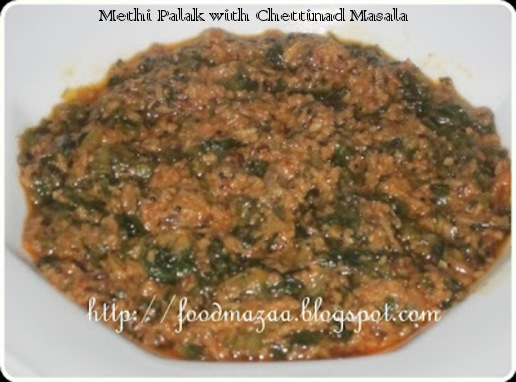 Quite an interesting combo, never thought of making a masala with these both greens,beautifully done. Ha ha .. Priya, I keep doing these crazy things sometimes and they work wonders.. Very delicious n yummy masala!! very interesting!! !new way to do this. i am a methi freak, so will surely try this. loveto see you at my space too.